How and why did girl groups begin? What is their purpose in the 21st century? Through first-hand accounts, material culture, academic literature, and case studies, we discover the importance of girl-focused organisations. Join us to discover the history and fun of the Girl Guiding UK, Girl Scouts of the USA, Rainbow, and Camp Fire Girls. Why do youth groups exist? Why are the groups single gender? How did girl groups emerge and what makes each group different from the others? Explore the tabs, videos, and scholarly reflections below to learn more about how girl youth groups began and led to today’s internationally-known groups. 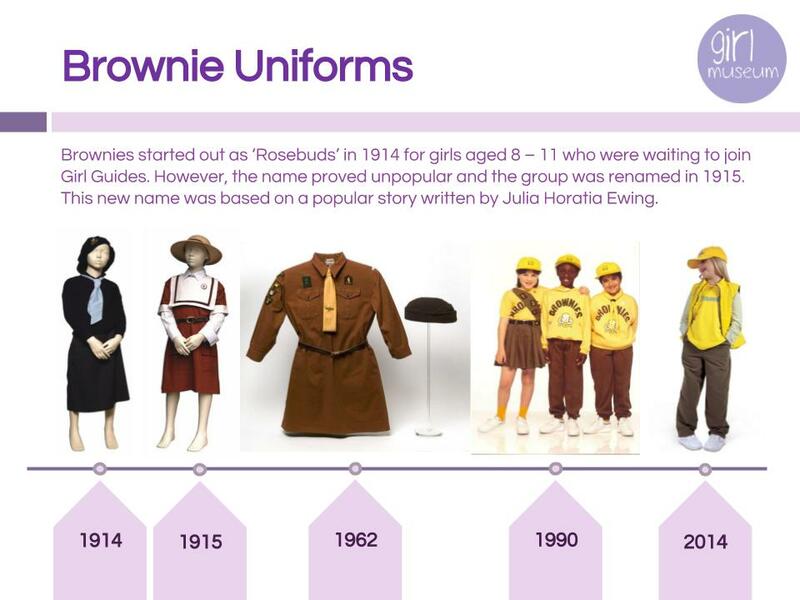 The Girl Guides were founded in 1909 by Robert Baden-Powell, who had started the Boy Scouts in the UK in 1907. Baden-Powell was an ex-army general who wanted boys to have good skills and fitness. The founding of the Scouts was a huge success, and lots of boys joined. 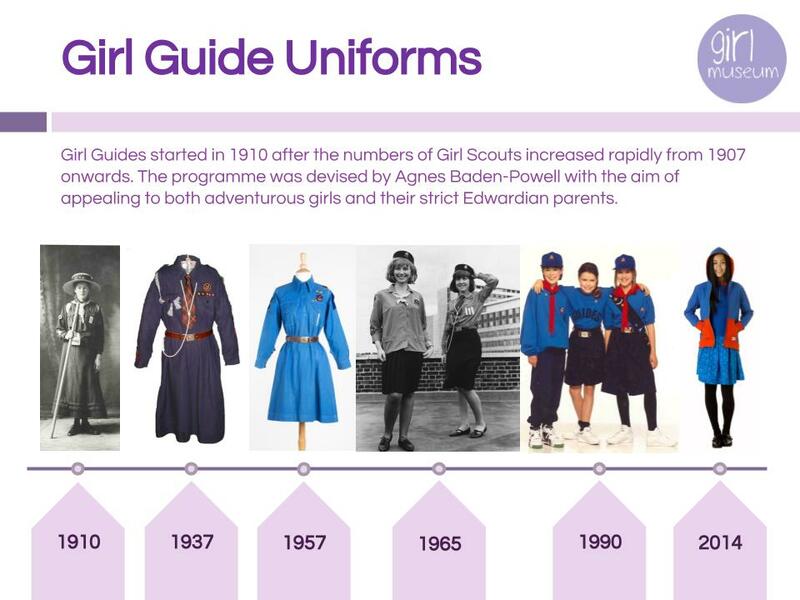 There was soon a demand for an organisation for girls, and Robert Baden-Powell asked his sister Agnes to help him to set it up. They were named for a group of “Guides” who patrolled the North-West Frontier in India (now Pakistan). From the beginning, Girl Guides were separate from Boy Scouts, but not subservient. The girls wore uniforms and earned badges, just like the boys. Nearly twenty years before all women got the vote in the UK, Guides could earn badges as electricians, cyclists, surveyors and telegraphists. 5,800 Girl Guides from 32 countries attended the Guides’ first world gathering in 1939. After Robert Baden-Powell married his wife Olave in 1912, she became the first Chief Guide in 1918. 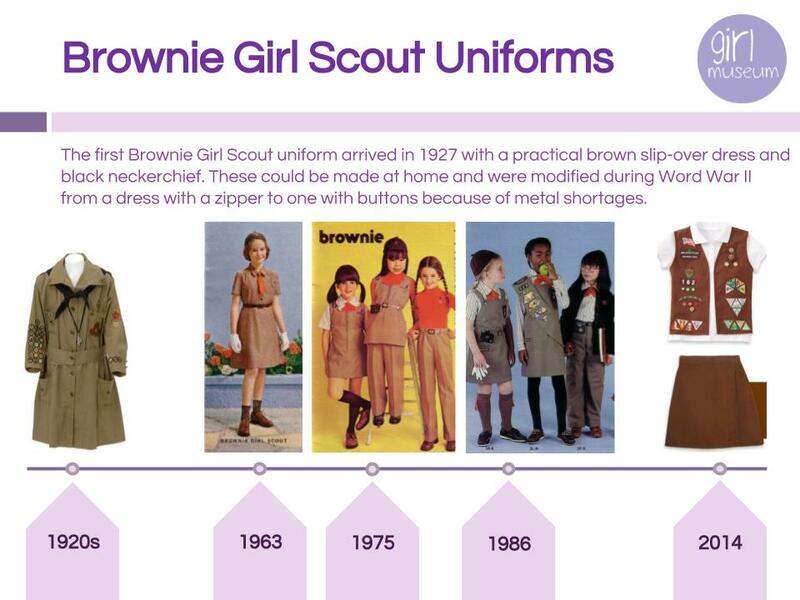 Inspired by the Girl Guides in the UK, lots of Girl Guide-style groups began popping up in the USA. In fact, two Girl Scouts of America groups were set up between 1910 and 1912. The first was run by Clara Lisetor-Lane from Des Moines, Iowa. Then, Juliette Gordon Low set up her group of Girl Scouts in her hometown of Savannah, Georgia. Gordon Low had met Robert Baden-Powell while she was in the UK. Once she returned to Savannah, she used her extensive social connections to spread the word and establish Girl Guiding in the USA. Her group was originally called the Girl Guides. Gordon Low attempted to merge her group of Girl Guides with Lisetor-Lane’s group of Girl Scouts, as they were so similar, but Lisetor-Lane was unhappy with the arrangement and refused. Her groups of Girl Scouts eventually died out, while Gordon Low’s Girl Guides went from strength to strength, soon becoming a national organisation. In 1913, Gordon Low wrote the American Girl Guides manual, “How Girls Can Help Their Country”, based upon the Baden-Powells’ writings. She suggested a name change to “Girl Scouts” to recall the American pioneers. The Girl Scouts really expanded in 1916, after the US entered the First World War. In 1911, an attempted merger with Lisetor-Lane’s Girl Scout groups fell through, and Gordon Low’s Girl Guides proposed a merger. 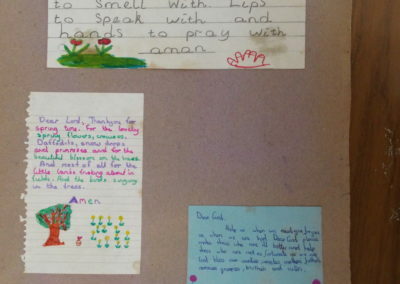 At the time Camp Fire Girls was a much larger organisation than the Girl Guides (with over 60,000 members) and Gordon Low’s proposal was rejected. The first official Camp Fire Girls handbook was published in 1914. In 1975, Camp Fire Girls decided to change their policy and become co-ed, and their name was changed to Camp Fire. The International Order of Rainbow for Girls (“Rainbow”) was founded in 1922 for girls whose fathers were members of the Masonic Lodge. It was established by Reverend W. Mark Sexson, a Freemason. The first class of Rainbow girls was initiated in April of 1922 at the Scottish Rite Temple in McAlester, Okalahoma. Each group is led by a Mother Advisor, the primary adult working with them, and an Advisory Board of adults that helps to supervise their activities. Each group also elects girls to serve various offices (also called Stations) in the local Assembly, which empowers them to plan and host their own meetings rather than being led by adults. Although originally a Christian and Mason-oriented group, today Rainbow welcomes girls from all religions and backgrounds. They emphasize the spiritual principles of being a kind and caring person rather a particular religion. Their basic teachings of faith, hope, and charity remain the same as they were in 1922, with all Rainbow members required to serve their community. Why do youth groups exist? Who pioneered the girl scouting movements? Why are the groups single gender? Learn the answers and more in this in-depth essay by Jocelyn Anderson-Wood. Can girl groups help transcend cultural differences and war? 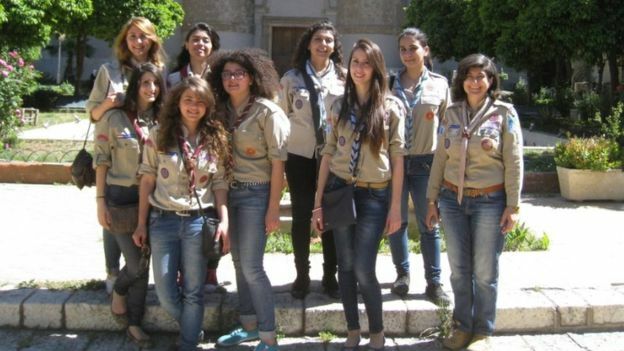 In a 2017 article from the BBC, members of the Girl Guides of Syria recalled how being together has helped them through six years of war and displacement. Begun in the 1950s, and banned from the 1980s to early 2000s, Syria’s Girl Guides was only recently granted full membership in the movement. According to one Girl Guide, Sham, the Girl Guides have helped her and her friends retain a sense of normalcy and pursue their dreams, despite six years of constant bombings and destruction. 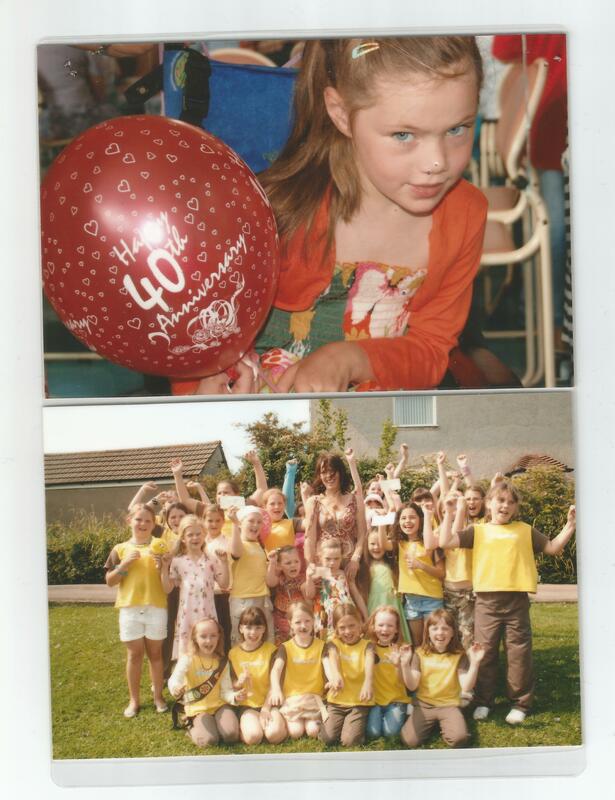 “Girl Guides has helped me to no end and it’s one of the reasons I consider myself successful. I am a part of the efforts of rebuilding Syria because I am a leader in the Scout movement.” – Sham, 22 years old. Sham’s group even transcended cultural differences, traveling to the Sudan in 2017 to help train girls in body confidence. Despite some positive experiences, Sham and her group have been affected by the war. As told to the BBC, some of her friends have died or had to leave, and the group can no longer travel without obtaining the Syrian army’s permission. Yet they continue on, welcoming members of all backgrounds and religious faiths, hoping that the Guides movement will build the next generation of female Syrian leaders – and a positive future for their country. GFS Lodge in Ballarat, Australia. Today, many girls know about the girl scouts and girl guides, but of course this is not the only girl group or even the first one. An important predecessor of the guides and scouts was the Girls’ Friendly Society, or GFS. Mary Elizabeth Townsend founded the GFS in 1875. She and her fellow “founding associates” wanted to create an organization to assist girls and unmarried young women who moved from rural areas to cities and large towns, usually in search of employment and better job opportunities to help support their families. They envisioned the GFS as an “organisation to hold out a friendly hand” to girls and young women, especially working-class girls and those separated from their homes and communities. As indicated by the name, friendship formed a central object of the society. The emphasis on friendship is reflected in motto of the GFS: “Bear ye one another’s burdens.” It also shaped the three broad categories of membership of the organization. Younger girls under the age of twelve were categorized as “candidates.” After one reached the twelve to fourteen years of age, they could take a candidates’ exam, which would ask them several questions about the “Candidates’ Catechism,” including writing out the motto of the GFS, giving an account of the work of the GFS, and also questions like “How can a girl be thrifty?” Once girls passed their candidates’ exam, they became “members.” Girls could remain members of the GFS until they married or until the age of twenty-five or twenty-six. Once girls married, they were no longer allowed to be “members” but could potentially continue to participate in the GFS as “married helpers” or “associates.” Associates were often middle-class and upper-class women supervised the candidates and members and acted as “guardian angels” to them. The GFS acted as a type of employment agency, where girls could go to find out about job openings and find advice about necessary training. Most girls, nearly two-thirds, worked as domestic servants, although other girls also worked as shop assistants, clerks, factory workers, and mill girls, and some members were daughters of tradesmen and farmers. 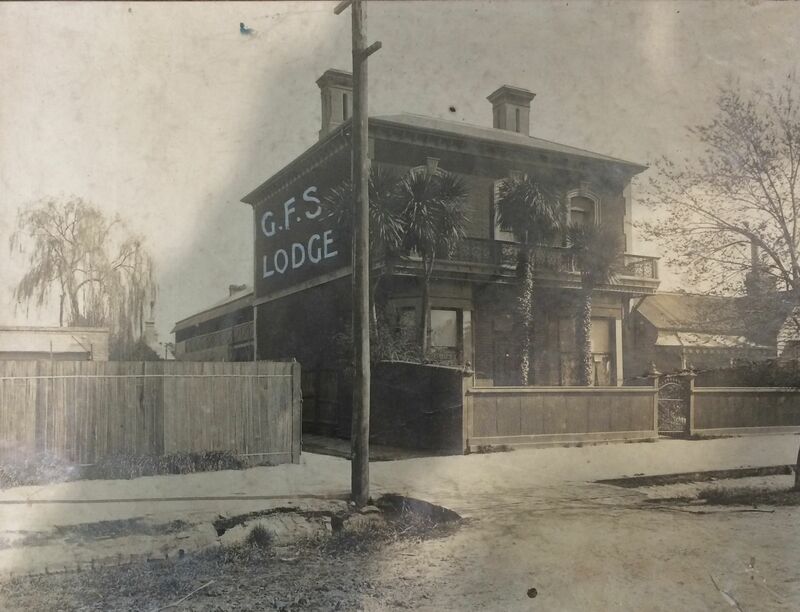 Since many girls who travelled to different cities and parts of the country had no place to stay, the GFS established lodges and hostels for girls in order to “provide friends for the friendless.” These accommodations gave girls a comfortable place to sleep and rest as well as entertainment and companionship and support. 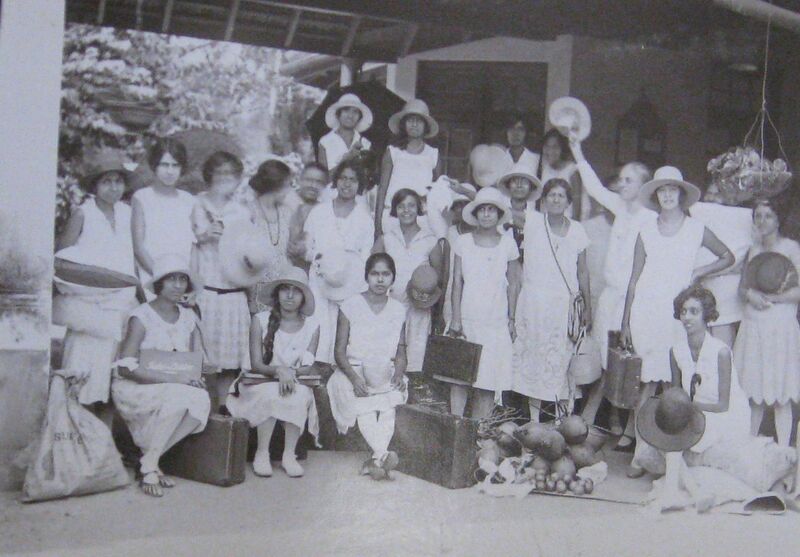 Led by lady superintendents – who were required to be “women of high character” – the hostels wanted to ensure that girls fell under the right influences. The GFS was closely aligned with the Anglican Church and offered religious instruction, including Bible study classes, and sponsored and raised money for missionaries. The GFS also provided other activities that aimed to instill in girls moral and domestic virtues as well as a sense of duty and responsibility. Girls could attend and participate in educational activities – like lectures (including lantern lectures, which incorporated images), reading circles, essay and scrapbook competitions, and debates – and take classes that taught them domestic skills, including needlework, basket-making, and cookery. The GFS also encouraged girls’ physical activity through the playing of sports, including hockey and tennis. 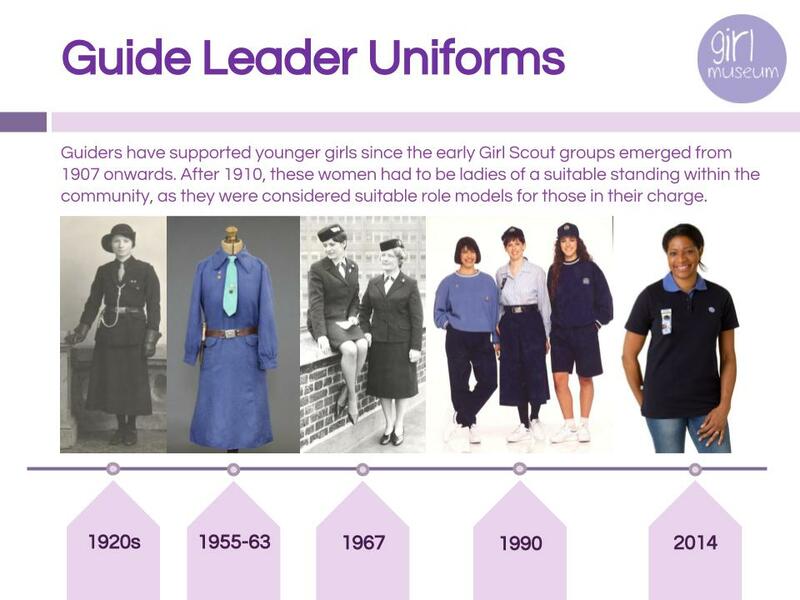 Following the formation of the Girl Guides in 1910, they even developed their own Girl Guide company. GFS Girl Guide meetings followed a similar format to regular Girl Guide meetings but incorporated GFS teachings, hymns, and prayers. 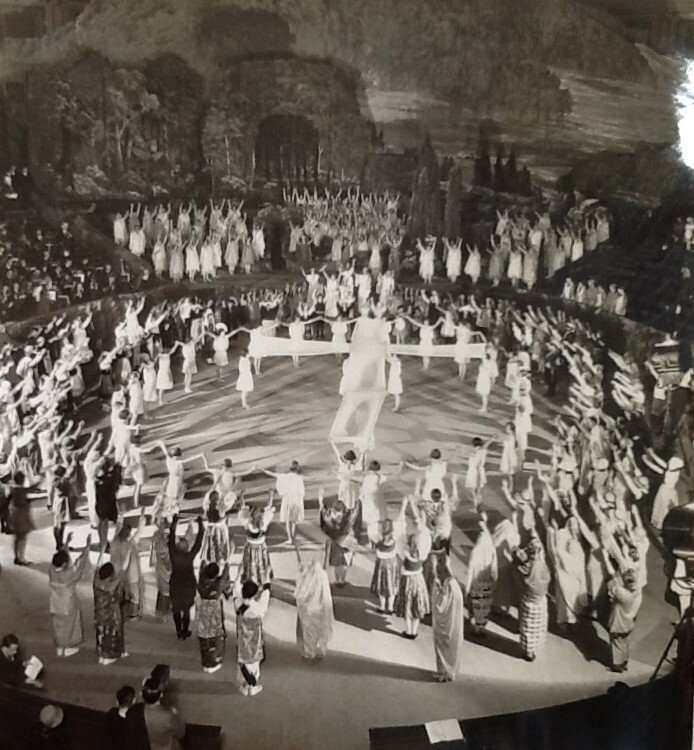 In addition to these religious, recreational, and educational activities, the GFS also hosted social events for girls, including parties, dances, plays, picnics, exhibitions, field trips, and pageants. In addition to these tableaus, girls also sang the songs, including the national anthem, and recited poems. They also featured a mini-parade, with girls holding banners representing their branches or dressed up wearing the outfits of different occupations: nurse, business girl, student, domestic servant, teacher, factory girl, doctor, land girl. In other pageants, girls could assume historical roles of great women in history, including Hatshepsut, Boadicea, St. Helena, Joan of Arc, and Queen Elizabeth. The GFS sought to connect its growing community of girls through a variety of means. It organized a “penfriend” program (like today’s pen pals) where girls from different branches would exchange letters and even small gifts. The GFS also produced a variety of newsletters – including G.F.S. Candidate, G.F.S. Associates Journal and Advertiser, G.F.S. Reading Union Leaflet, and G.F.S. Workers’ Journal – each aimed at a different category of participants in the GFS. 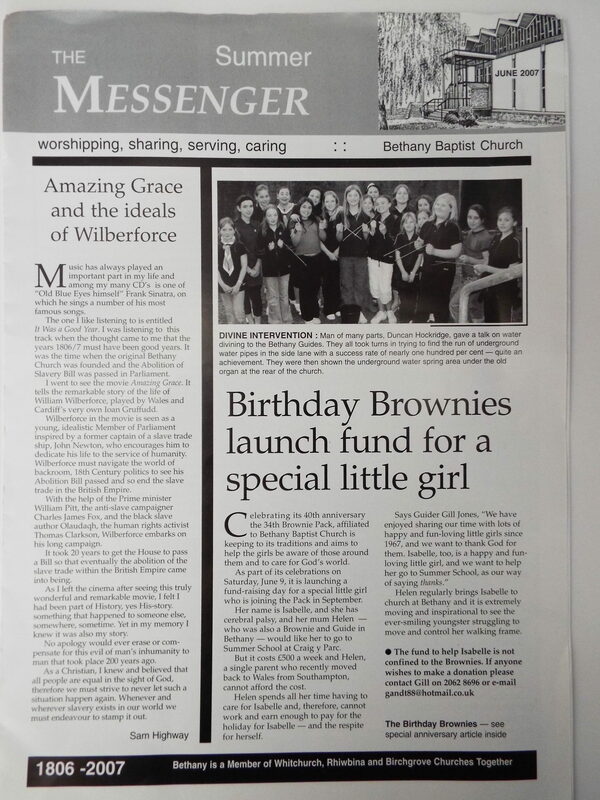 As reflected in this article, the organization described itself as “a very large family,” and other candidates and members were often referred to as “little sisters.” The recurring use of this familial imagery highlights how GFS newsletters sought to make girls feel part of a wider, interconnected community within the GFS. Although the GFS initially concentrated on providing shelter and protection to girls travelling within Britain, it soon expanded beyond this original function and began to establish branches throughout the world. Even before the GFS was formally founded, Townsend imagined it as a “vast organization” spread “throughout the world.” It established branches throughout the world, from France to Jamaica to Hong Kong to the United States. Like the branches in Britain, these GFS branches constructed lodges and hostels for girls who might have nowhere else to stay, helped them find jobs, and provided them with supervised activities, including lectures and field trips. By the commencement of the twentieth century, the GFS had transformed into a worldwide organization with 1,359 branches throughout the world that included over 240,000 girls and women. The decade before the First World War marked the height of the GFS’s popularity. During the First World War, girls in the GFS were active in the war effort, raising money for the War Relief Fund, making garments for soldiers, and training girls to be nurses. Some members also assisted the war effort by working in munitions factories. By the interwar years, the GFS had become an outdated organization that no longer seemed relevant to many girls. 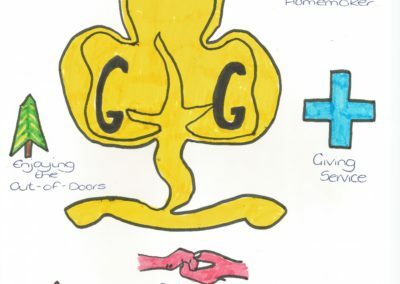 At the same time, the Girl Guides were growing in popularity, and while GFS organizers held on to the idea that the Guide Movement could not stand as a substitute for the GFS and saw itself as performing a necessary role for girls, girls themselves felt differently and saw the Guides as a more amenable avenue to gain the friendship and opportunities to engage in various activities and recreation through the Girl Guides and other organizations, including the Young Women’s Christian Association and Bible Class Union. However, the organization did not disappear entirely and continues even today. Today, there are around 20,000 members with branches throughout the world, including England, Australia, Sierra Leone, Papua New Guinea, Japan, Honduras, Mozambique, Korea, and the United States. It continues to offer programs for evangelism, support, empowerment, education, and encouragement. More information about the organization and its current activities can be found on its website: www.gfsworld.org. While the GFS’s influence was less extensive than organizations like the Girl Guides, it nevertheless was an important precursor to other youth organizations and provides insights into girls’ experiences and ideas about girlhood in the late nineteenth and twentieth centuries. Fabes, Ray, and Alison Skinner. “The Girls’ Friendly Society and the Development of Rural Youth Work 1850-1900.” In Essays in the History of Community and Youth Work, edited by Ruth Gilchrist, Tony Jeffs, and Jean Spence, 64-73. Leicester: Youth Work Press, 2001. Harrison, Brian. “For Church, Queen, and Family: The Girls’ Friendly Society 1874-1920.” Past and Present 61 (November 1972): 107-38. doi: 10.1093/past/61.1.107. Heath-Stubbs, Mary. Friendship’s Highway: Being the History of the Girls’ Friendly Society, 1875-1935. London: G.F.S. Central Office, 1935. Joyce, Ellen. Thirty years of Girls Friendly Society work. London: The Girls’ Friendly Society, 1912. Money, Agnes L. History of The Girls’ Friendly Society. Second edition. London: Wells, Garner, Darton & Co., Ltd, 1911. Townsend, Kathleen M. Some Memories of Mrs. Townsend: Foundress of the Girls’ Friendly Society. London: GFS Central Council, 1923. Janie Hampton writes in the introduction to her book, How the Girl Guides Won the War, that she didn’t enjoy being a Guide when she was younger. She reckoned they were “deeply uncool.” It was the 1960s when Hampton was in the movement, and she was a self-confessed flower-child. 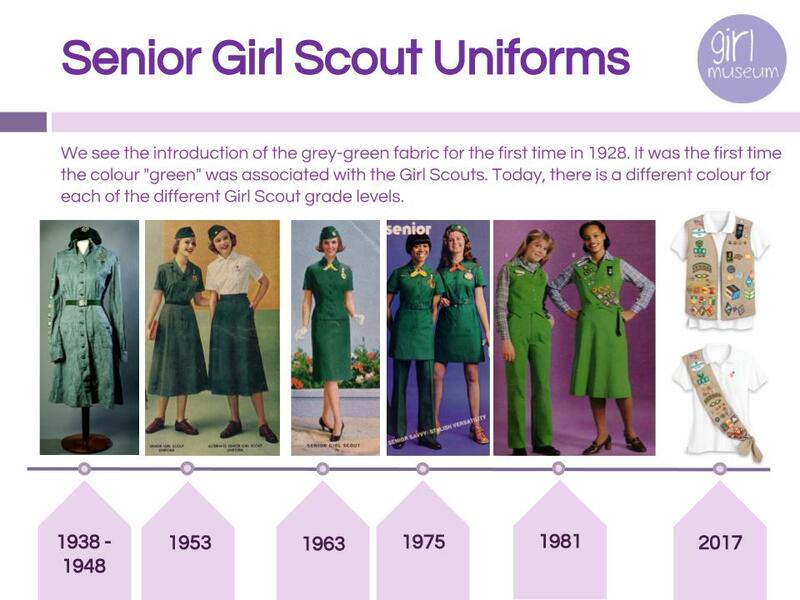 Hampton began researching for her book on Girl Guiding intending for it to be a satirical look at the uniforms, rules, and traditions. But, she writes, the more stories she researched, the more she found that Girl Guiding was a vital part of 20th century history. How the Girl Guides Won the War is full of inspiring stories of bravery and determination by women and girls during World War Two, and how their actions made a real difference to the outcome. The stories are from Girl Guides all over Europe and the world. Using interviews, diaries, and log-books, Hampton has uncovered some amazing tales about the power of girls. There are some truly inspiring individuals in the book who managed to keep to their Girl Guiding principles against adversity. An example is Krystyna Sroczynska, a Polish Guide. After the failure of the Warsaw Uprising, she led about thirty people out of an unsafe district via the city sewers. It was pitch black, and in places the sewage came up to their chests. They had to navigate their way through, while tied together, with the constant threat of being discovered by the Germans on the streets above, and the danger of grenades thrown into the sewer through manhole covers. Amazingly, they made it through the sewers to a safer area of Warsaw. There are also stories of Guides and Guide leaders who were interned in concentration camps yet still managed to secretly help other prisoners and worked to resist the German forces. At Stutthof Camp, “Guide Anna Paszkowska used her position as a manager in the Stutthof cobbler workshop to hide illegal activities such as exchanging letters between male and female camps, and sending the best quality goods to the prisoners and the worst to the German army.” When she and some other Guides discovered the Stutthof was to be shut down, they arranged to smuggle boots to the prisoners to wear during the evacuation. There are also some tragically sad stories, such as that of Mildred Wadell from the British island of Jersey, who before the war had run seven separate Brownie and Guide companies every week. During World War II the Channel Islands were occupied by German forces, and the residents suffered terrible food shortages and mistreatment. She had managed to survive, hand to mouth, while looking after her elderly mother. One night, in December 1944, she discovered a young German soldier trying to steal her rabbits. He was desperate to find food, and in his panic he shot her. The most fascinating story for me is of some Girl Guides stuck in a Prisoner of War camp in Japan-occupied China. In 1941, following Pearl Harbor, the 1st Chefoo Brownies and Guides at Chefoo School had their school overtaken by Japanese forces. The pupils were the children of Christian missionaries or businessmen and civil servants working in China. The school was used as an internment camp until 1943, when they were moved to the city of Weifang. Here, they had to join the ‘Civilian Assembly Centre’ of 1450 prisoners. 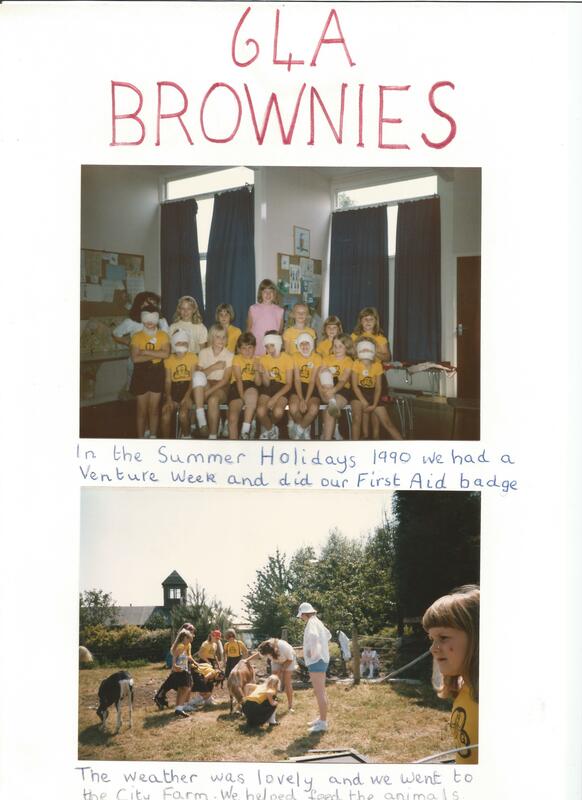 The prisoners organised everything, including cooking and cleaning, and even though the children had their fair share of duties, the Brownies and Guides still worked on their badges! There was often not enough food to go around, and by mid-1945 the situation was dire. As the American army closed in on the Japanese in China, the prisoners feared they were at risk of being killed by the Japanese. But on 17 August 1945, an American rescue plane arrived, and the prisoners were evacuated. The Chefoo Brownies and Guides had survived severe cold, lack of supplies, and intimidation from Japanese guards. It seems clear to me that the ideas and principles they had learned and tried to stick to as Girl Guides helped them survive the camp. It is clear that being a part of Girl Guiding meant a huge amount during the war. Hampton writes: “One Belgian Ranger managed to save just a single possession before her imprisonment in Auschwitz: her Guide badge. 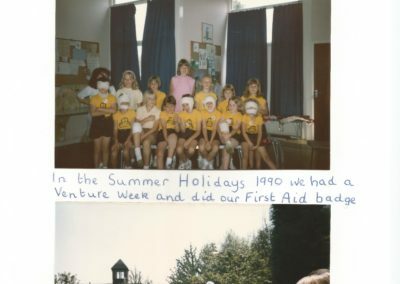 Whenever she was searched, she hid it in her mouth.” I think Girl Guiding must have provided some normality and security against the horrors and uncertainty of war. How the Girl Guides Won the War is full of absorbing tales of duty, teamwork, and cheerfulness, as well as revealing tales of courage in heart-breaking scenarios. The book proves that the work of Allied girls and Girl Guides all over the world did during World War Two was vital in securing victory over the Nazis. They raised morale, dug bomb shelters, delivered news, sheltered refugees, cooked, cleaned, mended, subverted, rescued, and fought. Without their bravery and hard work, the war may have turned out very differently. 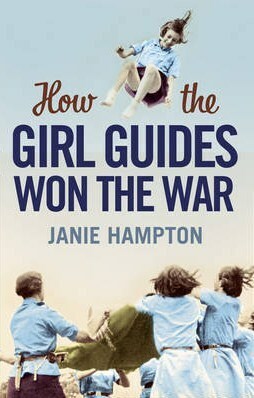 You can buy Hampton’s book, How the Girl Guides Won the War, on Amazon. Also be sure to visit her project, The World Menstrual Network, and support her projects with the Girl Guides of Malawi. Some things about girl groups are nearly universal. All groups have promises, mottos, or creeds by which their members live. Others have specific uniforms, denoting the age group of their members and their achievements. Nearly all groups also have some form of badge system that helps girls celebrate and showcase their achievements. In the sections below, explore how girl groups are alike and different in these foundations. What seems to be the most effective? How have history and gender equality shaped the evolution of girl groups? What can we learn from the material culture (objects) of girl groups? Promise: I promise that I will do my best, to be true to myself and develop my beliefs, to serve the Queen and my community, to help other people and to keep the (Brownie) Guide Law. Sign: Raise three fingers of the right hand, with the thumb holding down the pinky, while saying the Girl Scout Promise. The raised fingers represent the three parts of the Promise. Promise: On my honor, I will try: To serve God and my country, To help people at all times, And to live by the Girl Scout Law. I will do my best to be honest and fair, friendly and helpful, considerate and caring, courageous and strong, and responsible for what I say and do, and to respect myself and others, respect authority, use resources wisely, make the world a better place, and to be a sister to every Girl Scout. Indiana: Make great memories today, for they will last you a lifetime. Pledge: We’re committed to working hard, supporting each other’s holistic health and loving each other and the wider world. Hand sign: With the hands in front and together, left palm up, right fingers touch together in the left palm. Right hand circles three times upward like smoke from a campfire. Right hand ends extended upward with fingers together and pointed up, like the tip of a flame. Wish: To have fun. To learn to make all sorts of things. To remember to finish what I begin. To want to keep my temper in. And to learn of nature and living outdoors. To have adventures with everyone, To go to places and learn how it’s done. To make friends. 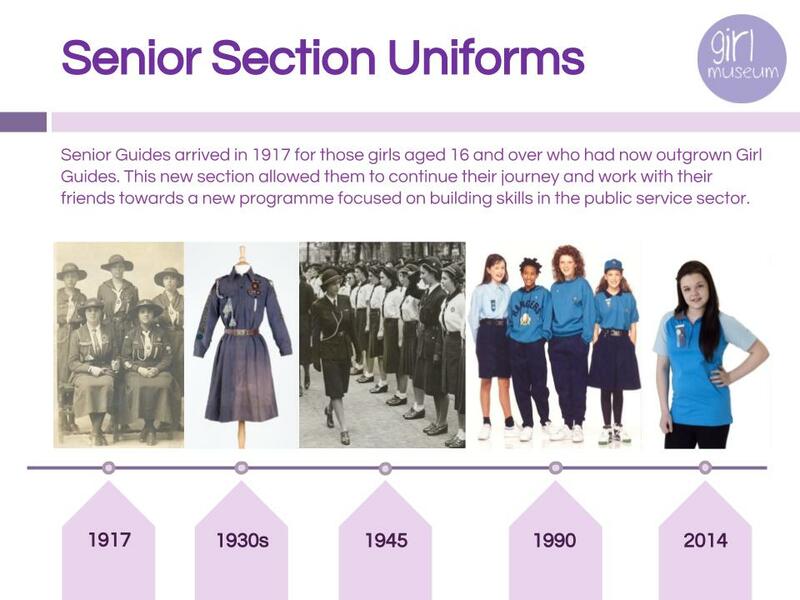 Scouting uniforms have varied through time, evolving to match new gender norms and the activities that guides engaged in during each period. Despite change, many of the groups had very similar uniforms at any given point in time. In the slideshows below, look at how each group evolved. 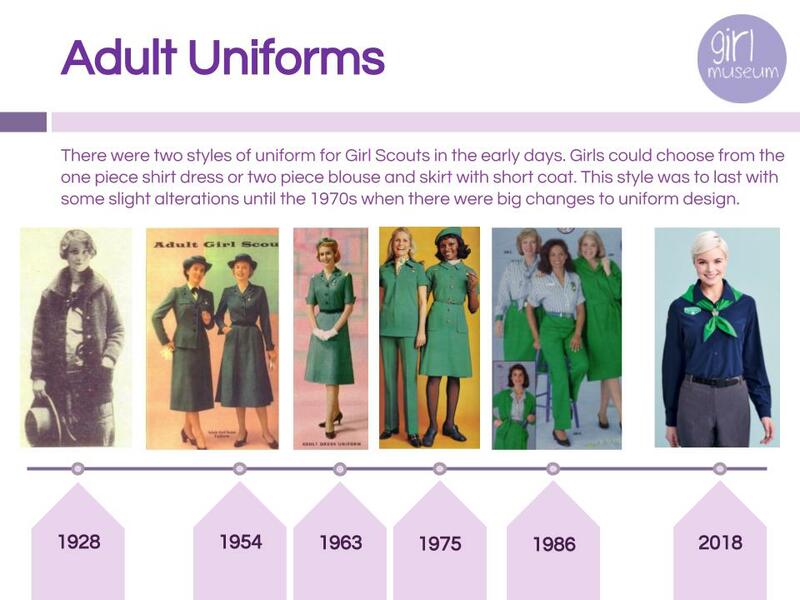 Compare the slideshows to see if you can find how uniforms were similar or different. Why might this be? 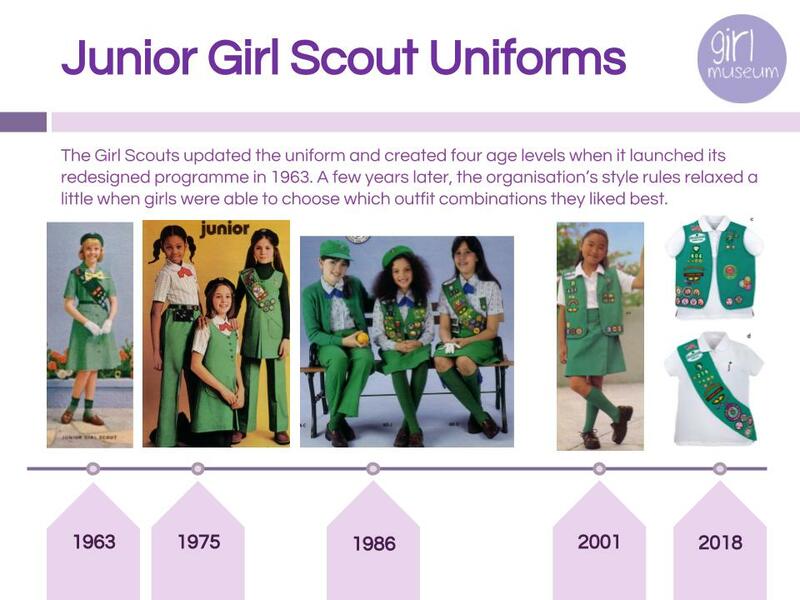 Were uniforms dictated more by gender norms or the activities that girls engaged in? Which uniform would you wear? Badges provide a way for girls to learn valuable skills and showcase their achievements to the world. Proudly displayed on their uniforms, badges represent a variety of skills and life lessons integral to empowering future leaders. Often, these badges reflect societal norms and expectations for girls. 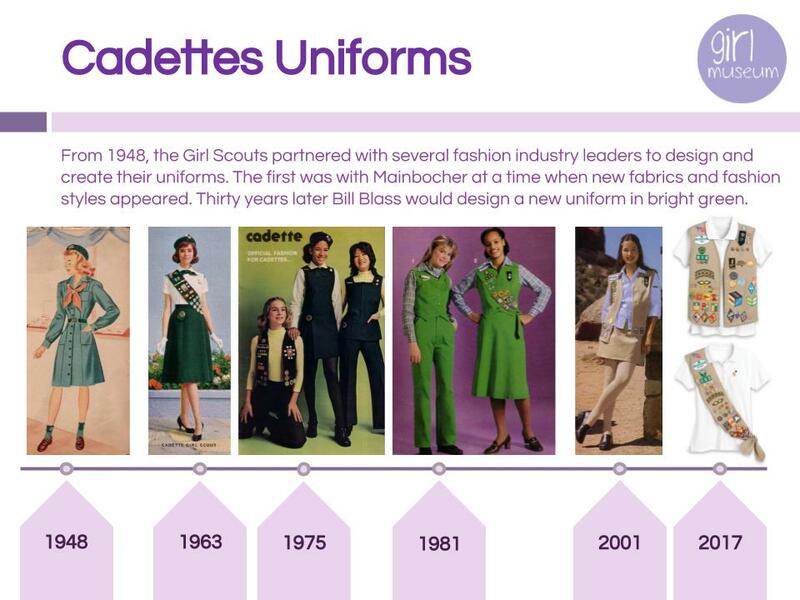 During the 20th century, badges evolved from more stereotypical feminine pursuits and nature skills to include learning skills that would help girls pursue careers and spark their passions. In the playlist at right, we explore many points of view on badges. As the video by Girl Scouts Rock showcases, earning badges empowers girls to be productive, helpful, and engaged citizens. While a parody, the video showcases girls’ enthusiasm about earning badges, becoming empowered, and showcasing their achievements. In these videos, what unites girls? What badges are they most proud of? How does earning badges help instill self-confidence in girls? Hint: It’s all about girl power! All videos are copyright their respective owners, and utilized for illustrative purposes only. 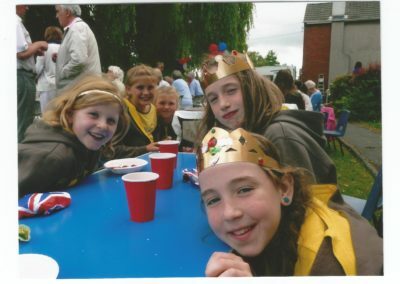 As part of their activities, many scouting groups hold annual or seasonal fundraisers. These events are an opportunity for girls to learn important skills such as goal setting, communication, money management, self-confidence, and leadership. One of the largest fundraisers is that of the Girl Scouts’ and Girl Guides’ cookie sales. Each year, the girls sell boxes of cookies to fund larger projects and experiences. For example, some troops sell cookies in order to reward themselves for a great year, using the funds to go on adventures or to summer camps. Others use the money to fund community service projects. These cookie fundraising programs also offer special rewards to girls who achieve milestone sales, helping motivate them and foster an entrepreneurial spirit. Girls also engage in fundraisers at other times of the year. 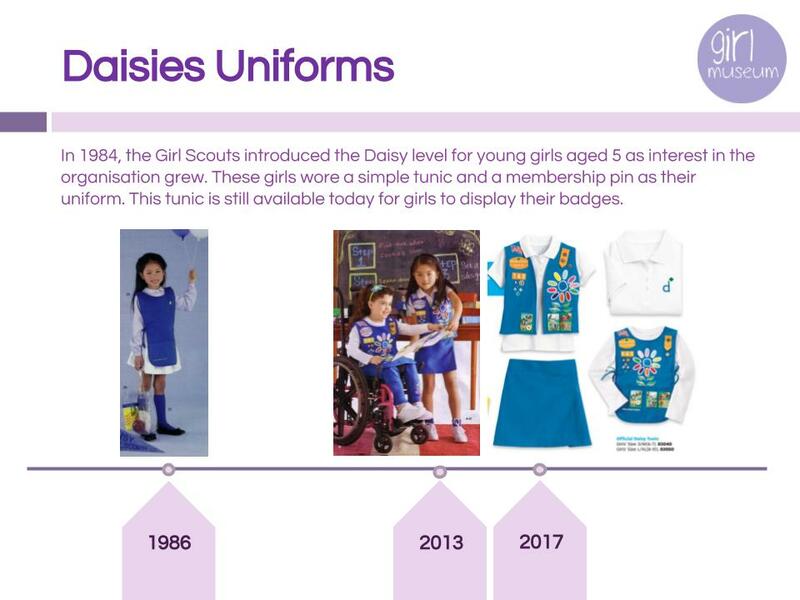 The Girls Scouts sell magazines, nuts, and candy that helps to raise startup money for troop activities, such as completing badges or buying supplies. Camp Fire troops sell candy as part of their fundraisers. Finally, the International Order of the Rainbow for Girls also holds fundraisers to support local charities, with each jurisdiction supporting a different charity each year. Most of all, girl groups are about being together. Through games, songs, service, and more, girls foster life-long friendships and learn valuable skills. These videos and journals reflect on girls’ experiences of scouting, both as members and leaders. They also look at how scouting has helped girls transcend boundaries, overcome obstacles, and become empowered women working for a better world. Video created by Jocelyn Anderson-Wood, who interviewed girl guides and leaders from the 69th Hull Girl Guides, 2018. 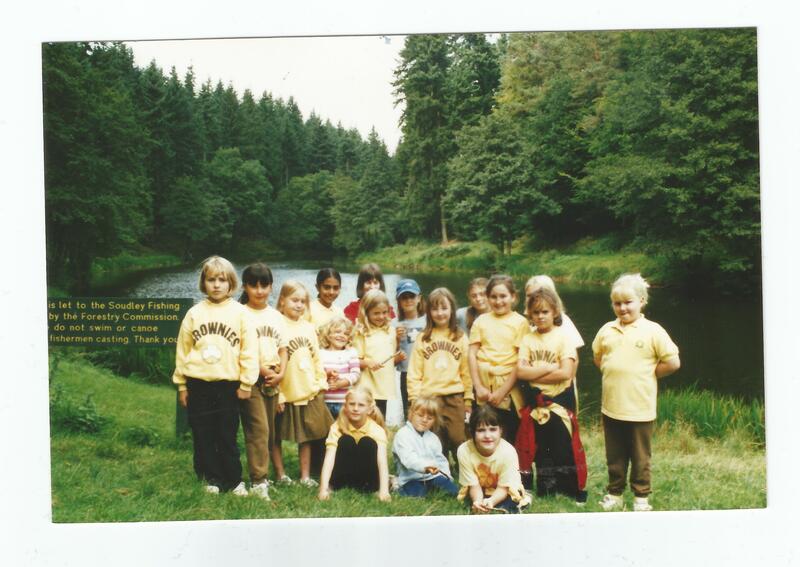 I joined Girl Guides when I was 10 years old; I hadn’t been a Rainbow or a Brownie. I loved the sense of belonging to something bigger and really enjoyed all of the opportunities Guiding gave me. At 14 I became a Young Leader, I was given more responsibility from collecting ‘subs’ to helping plan activities. I found that this helped grow my confidence and my people skills both in and out of Guiding. When I turned 18, I became a leader and became fully involved in planning trips and activities, liaising with other units, and attending events for leaders such as the Annual General Meeting. This gave me great life skills, including event planning, time management, and budgeting. When I sat down to write this piece, I realized there’s no way I can choose just one singular memory of my over 6 years as a leader. I’ve loved all of it equally. That’s not to say that at times it hasn’t been hard. When we run events for hundreds of girls, it is always stressful. When we take them on a hike, I always have a fear one of them is going to end up with a twisted ankle! But for me, all the stress and the planning is worth it. My favorite part of being a leader is making a difference in these girls’ lives. I love that I can be a role model and that I can help them to grow in confidence as I did. I try to help them through their worries about school or home and try to be a safe person for them to talk to. These girls are aged 10–16, some of the most challenging years in a young person’s life. I find it a privilege to be there for them and try my best to help where I can. I love being able to see my guides change from shy young girls into confident, thoughtful, and articulate young women. People have asked me in the past why I do Guiding and will I ever stop. My answer is always the same: I love helping to make a difference and I’ll never stop being a part of Girl Guiding. 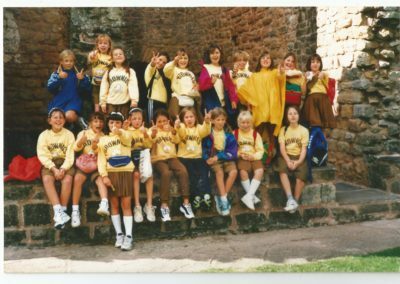 34th Cardiff Brownies have been meeting for over 50 years now. These are the memories we have cherished as a unit and kept safely tucked away in our little archive. 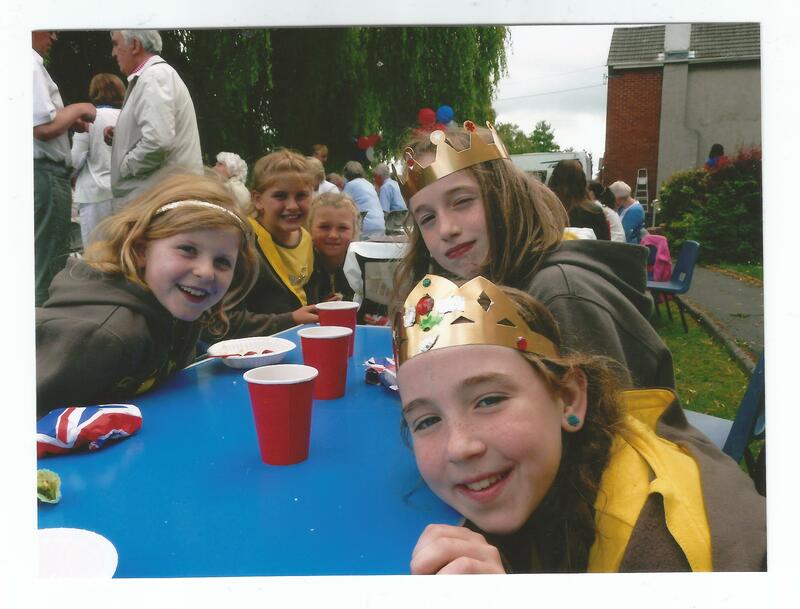 They give an insight into the adventures and fun we’ve had together as part of what is now Girlguiding UK. These activities have helped girls to develop key skills like fundraising for a local cause and learn new things. And, of course, let’s not forget the leaders who have helped run the unit and encourage girls to overcome boundaries, work together, and be themselves! 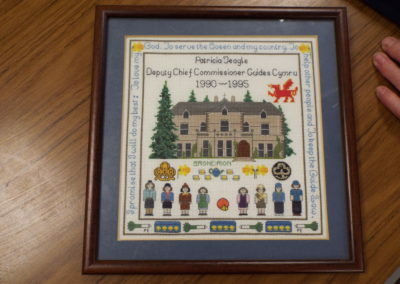 All images and videos in this section were provided by the 34th Cardiff Girl Guides and their related archives. Video footage and interviews compiled by Claire Amundson. 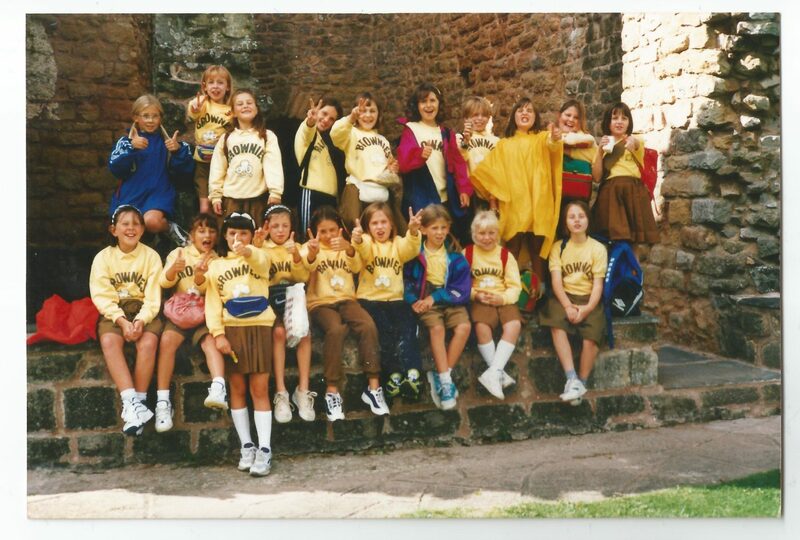 34 Cardiff Brownies, circa 1996. 34th Cardiff Brownies at Wildfowl and Wetlands Trust (Llanelli, Wales) on a unit summer trip. 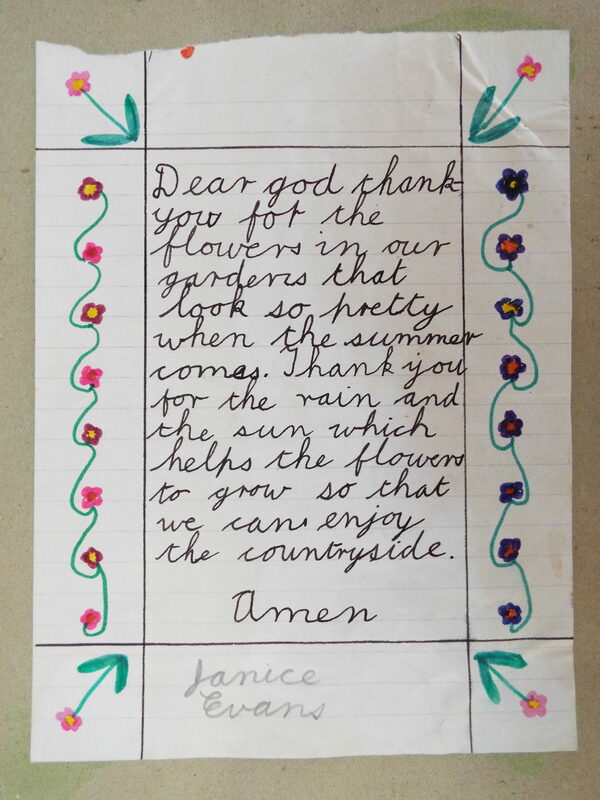 A prayer written by one of the girls from 34th Cardiff Brownies contained in their scrapbook. 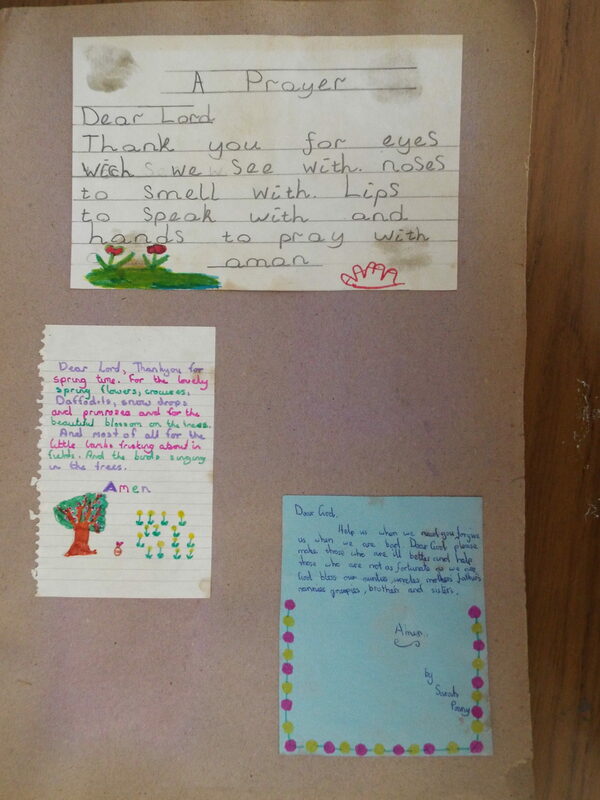 Prayers written by girls from 34th Cardiff Brownies contained in their scrapbook. 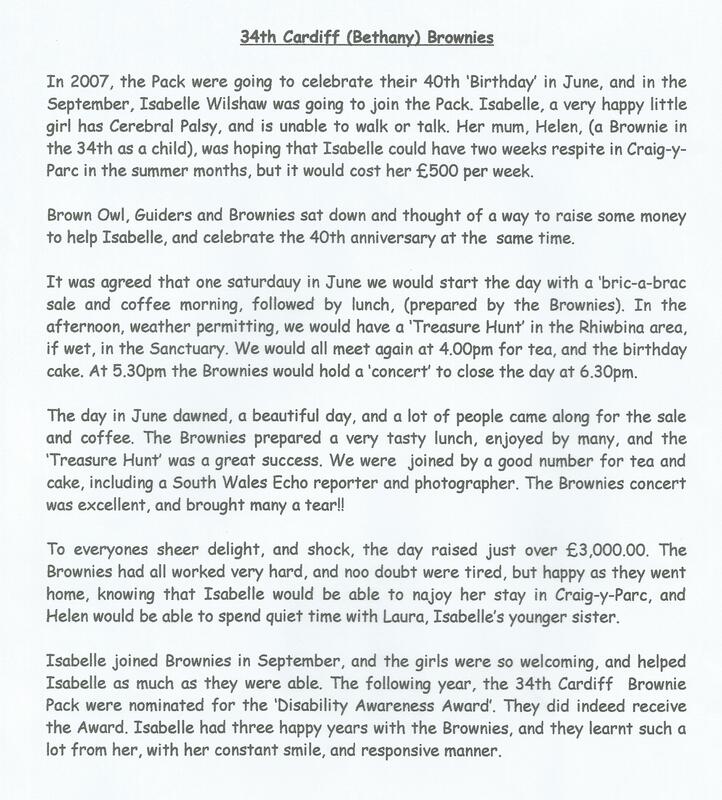 Newspaper clip from a local newspaper telling the story of Isabelle from 34th Cardiff Brownies. 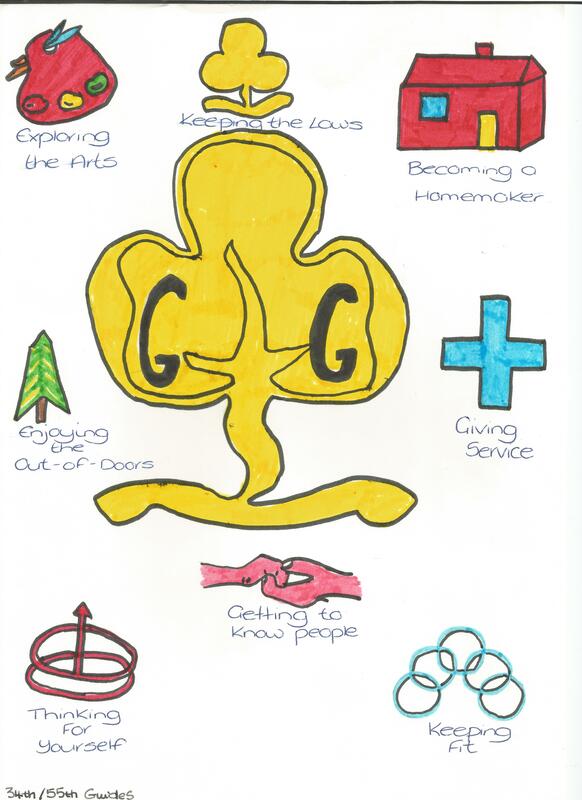 34th/55th Cardiff Guides put together a poster for Margaret Elmes displaying the key messages of Guiding. 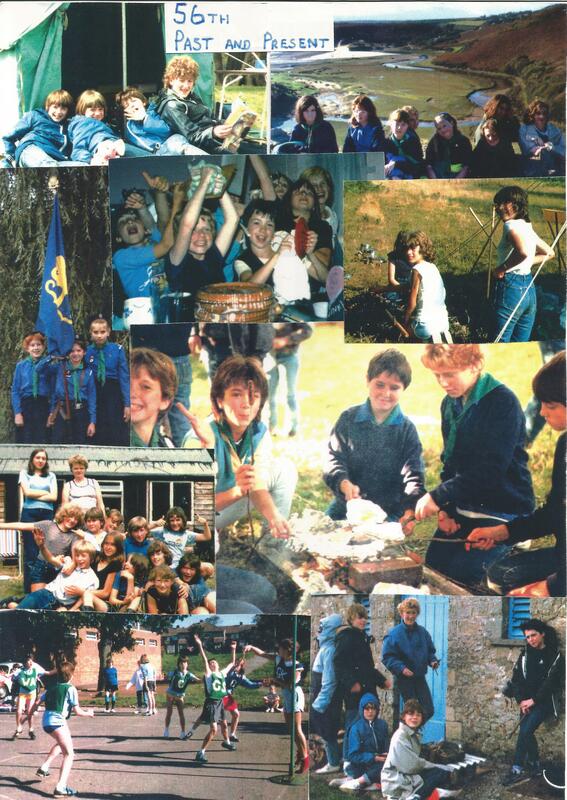 56th Cardiff Guides create a photo collage filled with memories of activities the unit have taken part in over the years. 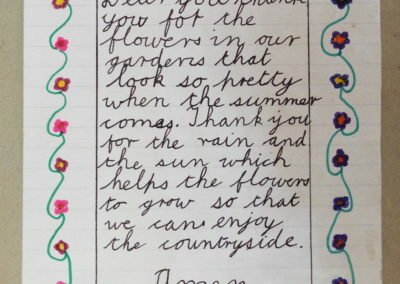 64A Brownies write about their Venture Week as part of their leaving message for Magaret Elmes. 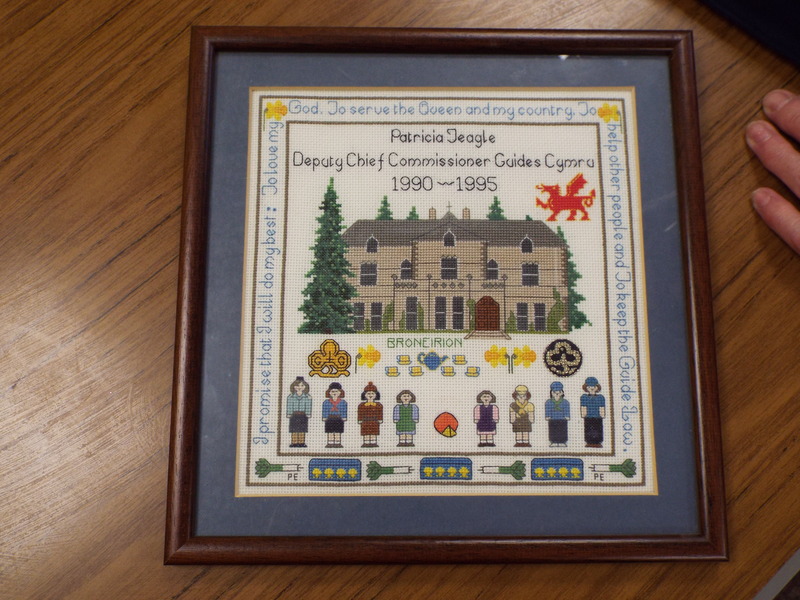 Created for Patricia’s retirement from Guides Cymru, this cross stitch work showcases the home, levels, and various elements of Girl Guiding. How do Girl Groups empower girls? In 2018, the #BecauseofGirlScouts chat on Twitter helped showcase the variety of ways that Girl Scouts – and all girl groups – help empower young girls and women. Why do some groups, like the Girls Brigade and members of the World Association of Girl Guides and Girl Scouts, remain single gender? A recent study found that girls “start to see themselves as less innately talented than boys do when they are only six years old.” Influences such as parents, teachers, peers, and the media means that an awareness of gender stereotyping begins to show at a very early age. Although a relatively small study on 400 children, the results show that gender stereotypes run deep. And a recent study by GirlGuiding UK (“Girls Attitudes Survey 2017”) has found that awareness of gender and gender stereotypes permeates in all aspects of girls’ lives and in turn affects their lives and choices. 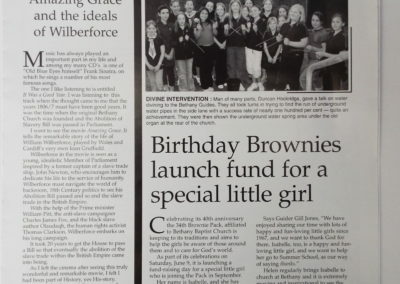 Julie Bentley, the head of Girl Guiding UK, described the Girl Guides as “the ultimate Feminist organisation” in 2012. And in a study of 250 “award winning women” in business, politics, sport, and other public occupations in 2007, two-thirds of them had been in the Guides as girls. More than 70% of the women who had been guides credited the movement with helping them succeed in later life (“Two-thirds of high-flying women had a guiding hand” Daily Mail October 30, 2007). But why can’t mixed groups work to combat gender inequality? Well, they can! Of course they can! And they do, every day. But the difference between co-ed and girl-only groups is a subtle one; it is the same difference as between equality and fairness. Equality is as it sounds – treating everyone equally. That’s how co-ed groups like Scouting UK and Camp Fire operate. They treat boys and girls the same way and so they do the same activities, the same games, wear the same uniform, and follow the same rules. But fairness is different. Fairness acknowledges that biases exist in society, and some groups are treated more unfairly than others. It understands that women experience sexism and people of color experience racism. Fairness understands these groups need help to succeed and end the biases. As a society, we believe equality and fairness mean the same thing, but actually, treating everyone the same erases our differences and promotes privilege. Fairness works to try to level the playing field. The Radical Monarchs from Oakland, California were founded on the principle of fairness. The group is only open to girls of color, aged 8 to 12. Rather than badges in swimming, cooking, or crafts, they get badges for social justice. The group was founded because young girls of color face discrimination as both women and people of color, and the group aims to teach the girls how to fight that discrimination in order to achieve justice in society. You can access an inspiring mini-documentary about the group here. The Radical Monarchs are unusual in that they focus on social justice topics as badges and activities. Most girl groups do not actively have a social justice agenda. Instead, the fairness comes from the space being reserved for girls. Membership in a group for girls only allows girls to be girls. There is no competing for attention with boys (who studies have found, often win), and less pressure to fit within gender stereotypes. It is difficult to find proof that all-girl organizations make a difference to girls’ prospects and to society. Most evidence is anecdotal. It is hard to study the impact because girls spend relatively little time in the group – perhaps only an hour a week. They spend far more time at home and at school, where they are subject to a huge variety of societal influences! However, the Girl Scouts Research Program is vital in investigating the views of Girl Scouts and their alumni. Their 2017 study, The State of Girls: Emerging Truths and Troubling Trends, has shown that leadership qualities developed in the Girl Scouts can help girls to live happier and healthier lives. In summer 2017, I interviewed Guides from the group with which I volunteer. Guides were largely stumped by my final question, “What do you think would be different if boys were in the group?” Most thought it would be different but couldn’t quite put their finger on why. I think this is because they were aware of the biases and stereotypes in society, but as they are so ingrained, it is often hard to pinpoint them and their effects. I asked their Guide leaders, “Do you think it’s important for girls to have a girl only space?” I got a much more definite answer: “Yes!” The adults were able to articulate much more easily why they thought that a girl space was important – less peer pressure to act a certain way, the girls can be themselves, and they don’t need to compete against others. This is the reason I volunteer as a leader with a Brownie pack, and why I think it’s important things like Girl Museum exist! In a world where girls aged just six can see themselves as “less talented than boys,” organizations purely for girls are vital. One of the reasons the founder of SpiralScouts, Pete Davies, started the group was, that he believes single-gender groups increase the gender divide. As he stated, “Boys and girls should learn together, just like in the real world, not segregating little soldiers over here and little homemakers over there.” Certainly, raising boys and girls to have different skills and interests will increase the gender divide – but in practice, a lot of single-gender groups now encourage similar values in children and children achieve similar badges. We asked these questions at the start of our journey. As we have seen, girl groups all began around the same time and for very similar purposes. Though each has unique aspects, the Girl Guides, Girl Scouts, Rainbow, and Camp Fire groups all share a focus on empowering girls through skill-building and community service. Today, girl groups continue to empower girls. They provide opportunities for girls to transcend boundaries of race, ethnicity, religion, and class while growing and learning together. They also have become far more inclusive, extending the invitations to girls (and boys) of all orientations and backgrounds. What has scouting done for you? What have you learned in this exhibit? Be sure to leave us a note in the comments section below. This exhibition was produced by Jocelyn Anderson-Wood, Claire Amundson, Hillary Hanel, and Tiffany Rhoades. Special thanks to Tiffany Rhoades for designing the exhibit’s button and banner images. Educational materials developed by Hillary Hanel, Claire Amundsen, and Lexi Burrows. Finally, our heartfelt thanks to all of the girls, women, and organizations who contributed to this exhibit, including the 34th Cardiff Girl Guides, 69th Hull Girl Guides, and Janie Hampton. Be sure to buy your books via AmazonSmile – and Amazon will donate to Girl Museum! “Picturing Girlhood in Empire: The Girl Guide Movement and Photography” in Colonial Girlhood in Literature, Culture, and History, 1840-1950 by Kristine Alexander. Youth, Empire, and Society: British Youth Movements by John Springhall. All information, pictures, and videos presented in this exhibit are utilized strictly for educational and illustrative purposes. No profits or revenues are generated by their exhibition. For Girl Museum produced materials and contributions from the public, credit has been given and signed permission granted. Names and their related marks, designs, emblems and images are owned by the respective groups, including Girl Scouts of the USA, Girl Guides, Camp Fire, and Rainbow. 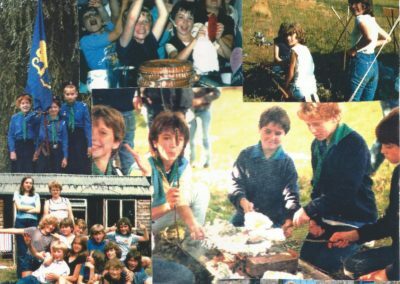 “The First 100 Years of Guiding” and “Baked Beans in Wellies: Memories of 34th Cardiff” were produced by Claire Amundson with permission and assistance of the 34th Cardiff Girl Guides. Photographs provided by the 34th Cardiff are utilized with full permission, and 34th Cardiff retains all copyrights.